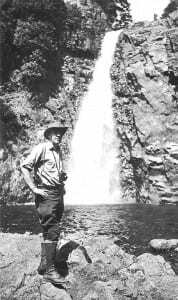 Howard Zahniser at Hanging Spear Falls in 1946. On Page 65 of this excellent biography is a photograph of Howard Zahniser in front of Hanging Spear Falls, on the Opalescent River. Snapped by the Adirondack conservationist Paul Schaefer in 1946, it provides a compelling visual reminder of the role of the Adirondacks in the story of wilderness preservation in the United States. Zahniser was the prime mover behind the national Wilderness Act, signed by President Lyndon Johnson on September 3, 1964—a watershed moment in American environmental history. And Zahniser’s thinking about wilderness and its preservation was shaped in critical ways by his admiration for the Adirondack Forest Preserve. Born into a deeply religious and well-educated family in western Pennsylvania in 1906, Howard Zahniser grew up loving the forests and bluffs along the Allegheny River. His father was a Free Methodist minister who moved every three years to a new congregation. Both of his parents instilled in Howard the importance of the written word, and a respect for the power of language was part of his heritage. His life’s work as an advocate for wilderness combined these threads from his childhood: spirituality, which he increasingly found in nature though he remained a Christian all his life, and a talent for cogent, effective writing, which he skillfully deployed as editor, essayist and speaker on behalf of the same nature that stirred his soul. After graduating from college, Zahniser taught high-school English. In 1929, a friend encouraged him to apply for an editing job at the Department of Commerce in Washington, D.C. This job did not suit his talents and interests, but it served as his entry into the world of the federal government. Soon he soon found a position writing for the Bureau of Biological Survey at the Department of Agriculture. (Although he didn’t know it at the time, this job also established his initial, though distant, connection to the Adirondacks; the first director of the survey was C. Hart Merriam, who in 1884 published Mammals of the Adirondack Region.) 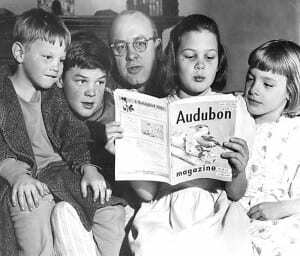 Zahniser wrote and edited articles about wildlife, both as part of his job and, starting in 1935, as a monthly columnist for Nature magazine. 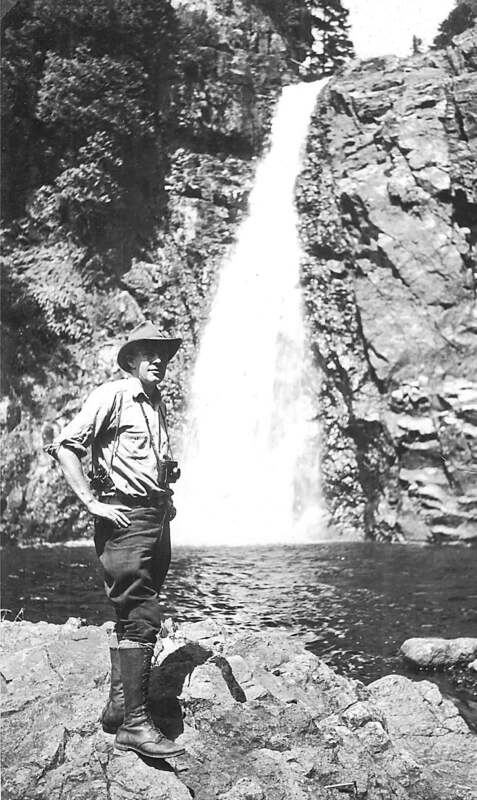 His life changed dramatically in 1945 when he accepted an offer to become executive secretary of the Wilderness Society, a decade-old conservation organization, founded by, among others, the Adirondacks’ Bob Marshall to promote the protection of wilderness in the federal domain—mainly in national forests and national parks. Moving to the Wilderness Society was a gamble. Its finances were shaky, and Zahniser was supporting a growing family. In 1945, he and his wife Alice were expecting their fourth child. But Zahniser recognized in the society’s offer an opportunity to influence the future of America’s public lands. With biologist Olaus Murie hired as director (working from his home in Wyoming) and with Zahniser editing its magazine, The Living Wilderness, and engaging in increasingly energetic lobbying in Washington, the Wilderness Society was poised to begin a period of intense activism, leading to the passage of the Wilderness Act. For nearly two decades, Zahniser—along with Murie, the Sierra Club’s David Brower, and a handful of other dedicated conservationists— would be in the thick of this country’s complicated effort to protect its remaining wild lands. 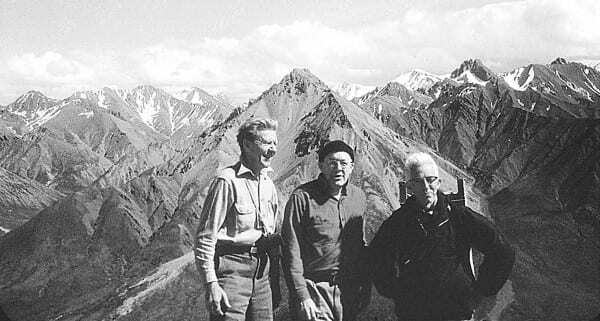 Olaus Murie, Howard Zahniser and Adolph Murie on Cathedral Mountain in Alaska. This was the beginning of a close friendship and productive collaboration. That July, Zahniser and his family joined the Schaefer family at the Schaefers’ cabin near Bakers Mills, in the southeastern Adirondacks. Zahniser climbed Gore Mountain and other nearby peaks, delighted in the abundant bird life, read Joel T. Headley’s classic 1849 camping narrative The Adirondack; or Life in the Woods, and learned from Schaefer about the history of the Forest Preserve and its protection by the New York state constitution. The highlight of Zahniser’s first visit to the Adirondacks was a camping trip in the High Peaks with Schaefer and Ed Richard, a local guide. Zahniser with his four children in 1951. The 1964 Wilderness Act defined wilderness, in part,“as an area where the earth and its community of life are untrammeled by man, where man himself is a visitor who does not remain.” The original law created 54 federal Wilderness Areas in 13 states, totaling 9.1 million acres.Today the national wilderness system includes 679 areas in 44 states, encompassing 107 million acres. More than half of these areas are in Alaska.Wilderness Areas comprise 2.6% of the land in the Lower 48.New York state has only one federal Wilderness Area: the 1,363-acre Otis Pike Fire Island High Dune Wilderness on Long Island.The Adirondack Park, however, contains 17 state-designated Wilderness Areas, totaling nearly 1.1 million acres. The Park’s State Land Master Plan defines wilderness in essentially the same language as the federal law.The Park also has about 1.3 million acres of state land classified as Wild Forest. The main difference between the two is that some motorized recreation is permitted in the Wild Forest Areas. The 18,000-acre St. Regis Canoe Area is managed as a Wilderness Area.Our reviewer, Philip Terrie, recommends two other books to readers interested in Howard Zahniser and the history of Adirondack conservation: Where Wilderness Began:Adirondack Writings of Howard Zahniser, edited by his son, Ed Zahniser (North Country Books, 1992) and Defending the Wilderness: The Adirondack Writings of Paul Schaefer (Syracuse University Press, 1989). After digesting Schaefer’s Adirondack history lesson and after marveling at the splendor of Hanging Spear Falls and the view toward Avalanche Pass from the Flowed Lands, Zahniser remarked, “So this was Bob Marshall’s country. No wonder he loved it so!” He contemplated the protection granted the “forever wild” Forest Preserve by the state constitution and noted the lack of such safeguards for the federal wilderness: “We need some strong legislation which will be similar in effect on a national scale to what Article XIV, Section 1, is to the New York State Forest Preserve. We need to reclaim for the people, perhaps through their representatives in the Congress, control over the wilderness regions of America.” Schaefer doubtless refined Zahniser’s words a bit for publication, but it’s safe to say that the birth of the national Wilderness Act occurred on this camping trip in the High Peaks. One result of his first visit to the Adirondacks was Zahniser’s purchase of 30 acres and a small house near Bakers Mills; it became a much-treasured destination for family vacations. There he drew spiritual sustenance from Adirondack forests and streams and enjoyed the intellectual ferment of lengthy conversations about wilderness and conservation with his neighbor and friend, Paul Schaefer. Another was that he returned to Washington with recharged energy. With a national wilderness preservation system always on his mind, he spent years embroiled in one cause after another, most notably the crusade to prevent the federal government from building a dam in Dinosaur National Monument on the Colorado-Utah line (Schaefer’s efforts to stop dams in the western Adirondacks provided a critical strategic model). Early in 1956, Zahniser wrote the first draft of the Wilderness Act and commenced an epic campaign. He dealt with recalcitrant senators, indifferent bureaucrats and apprehensive Western cattlemen and miners. He worked closely with professional conservationists and a cadre of increasingly sophisticated grass-roots organizers, East and West. He wrestled with thorny land-use issues such as grazing and mining, never to anyone’s complete satisfaction. He meditated on the place of wilderness in American history and culture. The bill was first introduced in the Senate in June 1956, by Minnesota’s Hubert Humphrey. For eight years, the Senate and House dithered and held hearings, where forces for and against the idea of a wilderness system presented their arguments. As Zahniser haunted the corridors and offices on Capitol Hill, the Wilderness Society’s board worried that his activism might threaten the group’s taxexempt status. He agreed to unavoidable compromises with politicians and carefully kept his board content. Throughout, his commitment to the wilderness ideal never wavered. Like Bob Marshall, whom he never met but whose dedication to saving the nation’s wilderness heritage inspired a generation of activists, he remained a firm believer in the value of wild places to American culture. To Zahniser, wilderness was vital for “human health, welfare, knowledge, and happiness.” Equally important, the wilderness taught people humility and instilled a sense of community with the rest of the natural world. 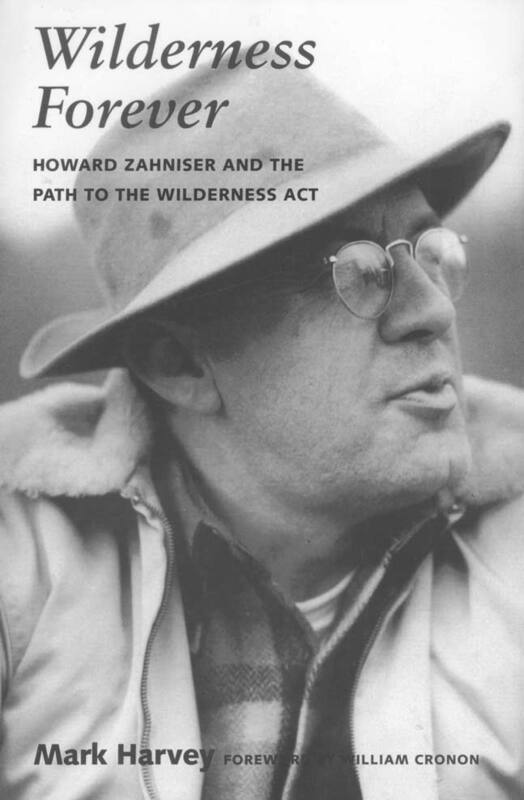 Howard Zahniser died of heart failure, at 58, on May 5, 1964, four months before his much contested and amended wilderness bill became the law of the land. By 2005, statutorily protected federal wilderness comprised over a hundred million acres (still, less than 2.6% of the land of the lower 48 states is thus protected). Zahniser’s role in this saga is recognized by a handful of environmental historians, but his importance to all Americans who value what remains of their wilderness has never been widely understood. With this clearly written and prodigiously researched book, Zahniser can take his rightful place alongside Rachel Carson, Bob Marshall, Aldo Leopold and the tireless few who devoted their lives to protecting the natural systems that sustain us. And those of us whose wilderness passions are centered in the Adirondacks can take special pleasure in knowing that on a hike from Heart Lake to Upper Works, the National Wilderness Preservation System was born.